Dropped into "Drift" at Point Lookout this afternoon, Jennie had emailed me to say all the pots I'd given to her after the market last weekend had been sold in two days, yippee! 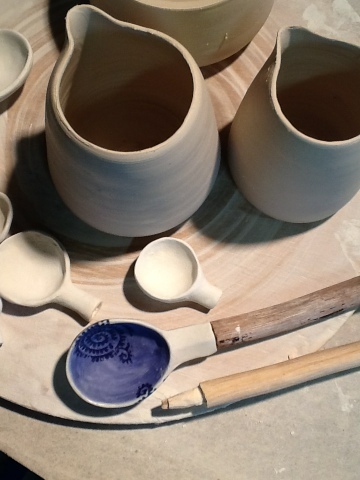 It is great to have a local gallery carrying my ceramics I should have made work for Jennie sooner. It's been a wet, wet, wet, weekend. The rain has been pouring down and nothing is drying in the shed and it feels like watching paint dry. I was wanting to make some other work besides market work as it seems I've been doing nothing else for months. Well my wish has come true and I've had a shot in the arm. I've been invited to join an exhibition of mixed work, paintings, ceramics etc. The shore birds workshop has had ideas buzzing in my head so I think I will make a series of pieces based on the birds who are just about to leave for their long journey north for winter. It means a lot more walks at low tide on the mud flats with the binoculars, I will mull it over and see what else comes into my mind. I'm excited! 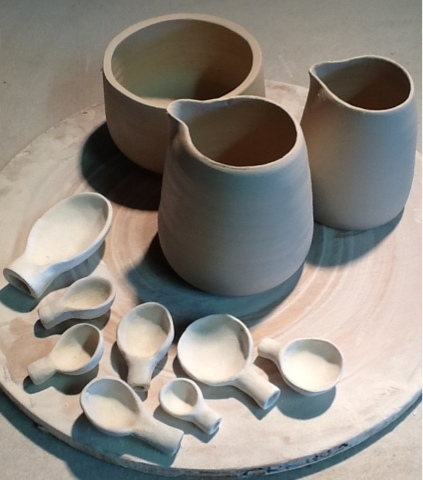 I've been throwing some small creamer jugs and sugar bowls along with hand making some spoons to go with them. I have been gathering pieces of driftwood on my walks and will make handles out of them. I have to shape the end of the wood to fit in the spoon head as you can see below. 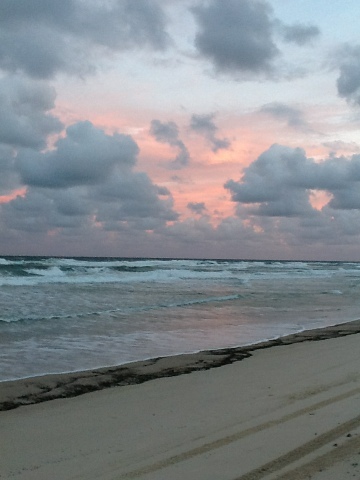 A photo of Main Beach at dusk the other evening when I was looking for turtle hatchlings, but no luck. The black line along the water line is pumice from some long ago eruption of a volcano.